Breathe easy with up to 2 years of ink in-box. Experience truly uninterrupted printing, exceptional savings and super convenience with up to two years of ink‡, based on printing approximately 300 pages per month, using only the cartridges provided in-box. Revolutionary INKvestment Tank Ink System. Brother reengineered its ink cartridges to hold more ink and created an internal ink storage tank delivering more pages of uninterrupted printing. Large page yields and low-cost printing. Help extend the savings when it's time to replace your ink supply with Super or Ultra High-Yield replacement INKvestment Tank cartridges. Print for less than $0.01 per page in black and less than $0.05 per page in color with INKvestment Tank Ultra High-Yield replacement cartridges‡. Print with confidence using Page Gauge. Help take the guesswork out of when to replace ink by using the unique Brother Page Gauge‡, a visual, numerical way to know the amount of ink you've used and the amount of ink you have remaining. Versatile paper handling increases productivity. The 250-sheet capacity paper tray accepts up to 11"x17" paper for printing ledger size documents. An up to 100-sheet multi-purpose tray delivers added capacity and lets you print on envelopes, cardstock and other media for diverse printing needs. Engineered to deliver efficiency. Up to 50-sheet automatic document feeder helps save time with multi-page copy, scan and fax. Fast print speeds help get jobs done quickly. Intuitive Cloud connection. 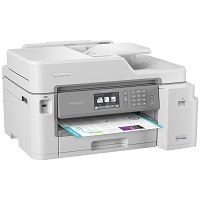 Print-from and scan-to popular cloud apps directly from the 3.7" color touchscreen including Dropbox, Google Drive™, Evernote, OneNote and more‡. Help save time by creating custom shortcuts right on the touchscreen for your most used features.